Whether it is a small or large living space in Indian Trail, NC, you would like to see it reasonably clean all the time. A clean home makes you start your day at an upbeat node and feel the freshness in your day-to-day life. A crucial part of the living satisfied with your Indian Trail, NC home comes from the habit of regularly cleaning the floors and carpets around your home that helps the environment keep hygienic and healthy. Using the most effective residential steam carpet cleaning in Indian Trail, NC specific to your condition, Mr Clean Carpet Cleaning ensures deep cleaning effects with organic cleaning solutions and professional-grade equipment in a combo. Our expert technicians will work with precision to maintain cleaning quality in every nook and corner of the carpet. We deliver high standard residential steam carpet cleaning in Indian Trail, NC – which does not cost high, but enables you to enjoy the freshness and cleanliness of the home carpet for a long time. We custom tailor residential steam carpet cleaning service in Indian Trail, NC for excellent carpet cleaning results without the use of harmful chemicals. Using the proven hot water extraction method, Mr Clean Carpet Cleaning cares to pre-vacuum, pre-treat spots/stains, pre-spray and extract as much dirt as possible from your home carpet surface. Our natural carpet cleaners along with deep extraction process aims to give you a superior cleaning touch with enhanced carpet life. 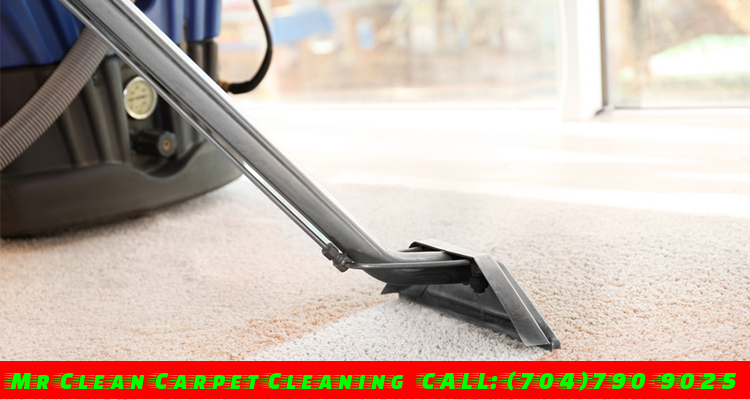 Call us to take care of your residential steam carpet cleaning needs in Indian Trail, NC the very best. Be sure to steam clean your residential carpet to the highest standard and at the best price with us in Indian Trail, NC. Mr Clean Carpet Cleaning offers highly productive commercial steam carpet cleaning in Indian Trail, NC to maintain the aesthetic look and investment value your commercial carpets while upholding the hygiene of the commercial place. We are the one whom you can entrust your commercial carpet cleaning job with the advantage of state-of-the-art equipment and trained technicians. In many situations, the thoroughness of our commercial steam carpet cleaning process and convenient cleaning schedules will help you reach your cleaning goals properly. We are always available to make your commercial steam carpet cleaning in Indian Trail, NC a stress-free experience. After a quick inspection, we offer a free quote and plan out a perfect cleaning package so that the deepest dust and stubborn stains can be taken out from the commercial carpet without losing peace of mind. Our reliable commercial steam carpet cleaning in Indian Trail, NC can be scheduled as per your preference and needs. We assure that you don’t face loss in business productivity just because your carpet has been lying wet for days. Mr Clean Carpet Cleaning takes up every size commercial carpet cleaning job with equal enthusiasm. Whether you are looking to revive the antique rug or the comprehensive cleaning of workspace, you can expect the job to get done on time and within budget. Keep in touch with Mr Clean Carpet Cleaning at (704)790-9025 and book an appointment early!